As you may know, I love to have homemade entrees made in advance and waiting in the freezer. It is my way of facing head-on our sometimes too-busy-to-make-a-decent-dinner schedules. And unlike my secret lasagna, this steak takes very little time to prepare. I make a big batch, then portion it into freezer bags (enough to serve 4 in each bag). Come 'steak night' I just make a simple salad and roast some vegetables and dinner is made---it really IS as simple as 1-2-3. Basic Rub (from book Grill Every Day by Diane Morgan) Makes 1 1/4 cups. I love making rubs. I see them all the time at the market and in specialty shops. 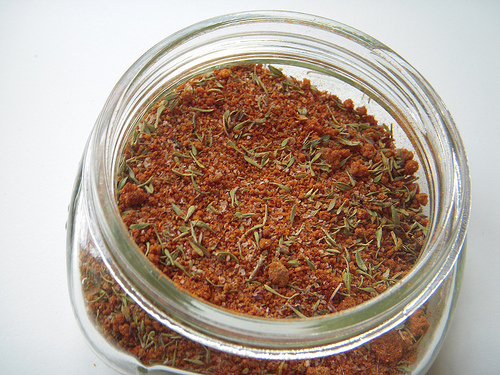 If you have access to bulk herbs and spices, then I recommend making your own (Costco has inexpensive big batches of herbs and spices; during summer I actually grew and dried a bunch of herbs to make rubs. Especially my default herbs). It is far more cost effective and makes the best gifts. Just last month I put together this basic rub in a handsome jar, and gifted it to my brother for his birthday. Although homemade gifts take time, your thoughtfulness and effort on behalf of the recipient is worth it. I even have a whole category dedicated to food-inspired homemade gifts: hostess gifts. (BTW rub keeps for 6 months---away from light and heat). I have also made and given this Latin Rub (notice the jars! ).